October 31, 2012 Huge Day! Ingram had an MRI scheduled for early this morning. Needless to say, the days leading up to the MRIs are very difficult emotionally. If the tumor returns, it is a really bad sign. We know that and so we tend to go into them thinking we are about to find out if our son will live or not. We also know that God’s power to heal isn’t limited by the historical evidence that shows that when the tumors return, the odds are much worse. And frankly, we don’t put much stock in odds. Doing so implicitly limits our faith. However, we don’t know what God’s plans are for Ingram’s life. 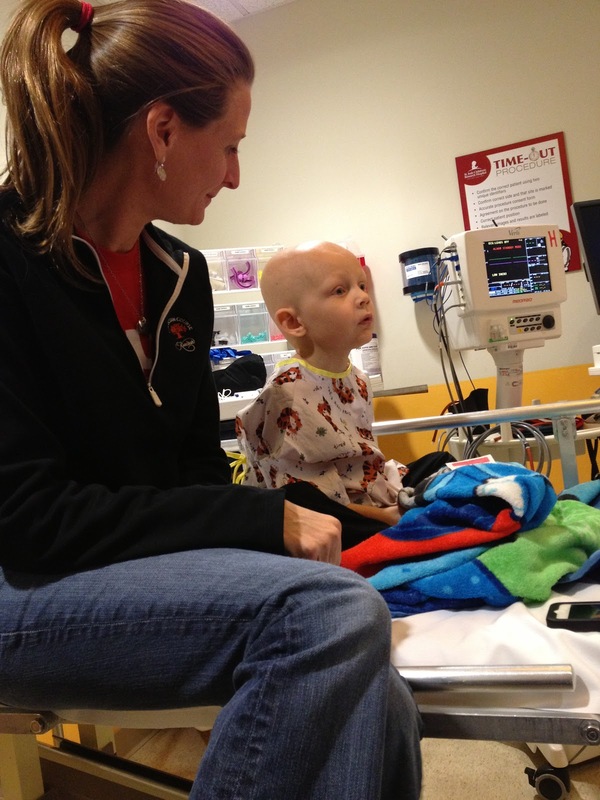 We pray every night that His will would be to heal Ingram’s little body. But, we don’t know that this is His will. Unfortunately, perhaps, the Bible doesn’t say that if you pray to God, He will heal you. It doesn’t say that if you pray, He will make you happy, or successful, or anything like it. It says that if we pray, He hears us. And that He loves us. I suspect if He gave us everything we asked for in our selfish pursuit of happiness, we would be quite unhappy. But more importantly, our lives might not glorify Him and that is, at the end of the day, what our lives are for. So we are left in this uncertain place where we know God can heal Ingram, but we don’t know if He will choose to. There are so many children whose parents have prayed the same prayers that we have, and with equal faith. And God did not choose to heal their children. That is hard for us to understand. But we also know that God loves Ingram more than we do and anything that hurts us hurts God even more. That’s about the only comfort we have. And so we go into these MRIs thinking that we will get to find out what God’s will for our son’s life is. But I guess all of us are doing that every day, it’s just a little more acute of a reality for us. I got to spend the morning with Ashley and Ingram at the hospital and doing so is a hoot. Ingram is such a stud. And a monkey. And a lot of other things. So we got there for his MRI at 6:45 and got situated. After an hour or so of getting ready for sedation, he was sedated and went back. 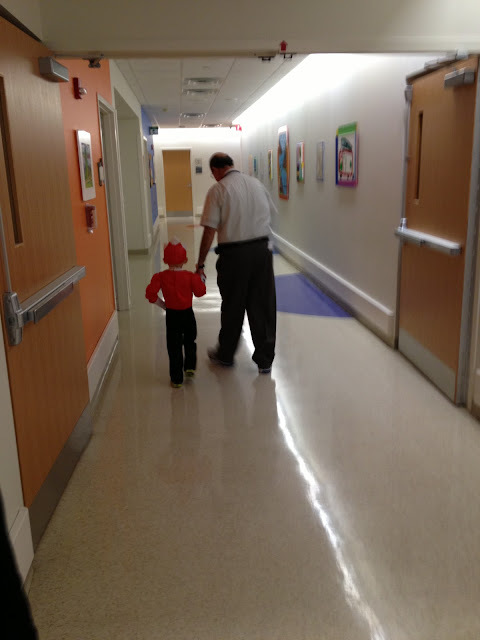 The MRI lasted about an hour and fifteen minutes. Afterwards, he was pretty groggy, but that didn’t stop him from putting on his red power-ranger outfit for Halloween St. Jude-style, which is out of control! Before we went to do Halloween stuff, he wanted to see Dr. Bikazi. He loves the people at St. Jude, and he knows many of them. His favorite anesthesiologist is Dr. Bikazi, or Dr. Bikai as Ingram calls him. In fact, when we were on stage at the Grizzlies event on Monday, Ingram asked me were Dr. Bikai was. Dr. Bikai is from Beirut and is a child at heart. He loves the kids and gets down and plays with them. Like so many of the people at St. Jude, he is great at his work but is just as good at connecting with the kids. After that, we went to hang out at the cafeteria until we got the results. A little after 12:00, Dr. Gajjar was ready to talk. We went back into E Clinic (the part of St. Jude that works with brain tumors) and he came in and said somewhat nonchalantly, “So, the scans are clear.” To us, it comes across as, “No big deal, but you don’t need to worry about losing Ingram for at least another three months.” I wanted to jump up and say, “It’s a HUGE deal! Come on, Dr. Gajjar, get excited... put your hands in the air... pump up the jam baby!” Sorry, that dates me. But that’s what I was thinking. Maybe not in those specific words. 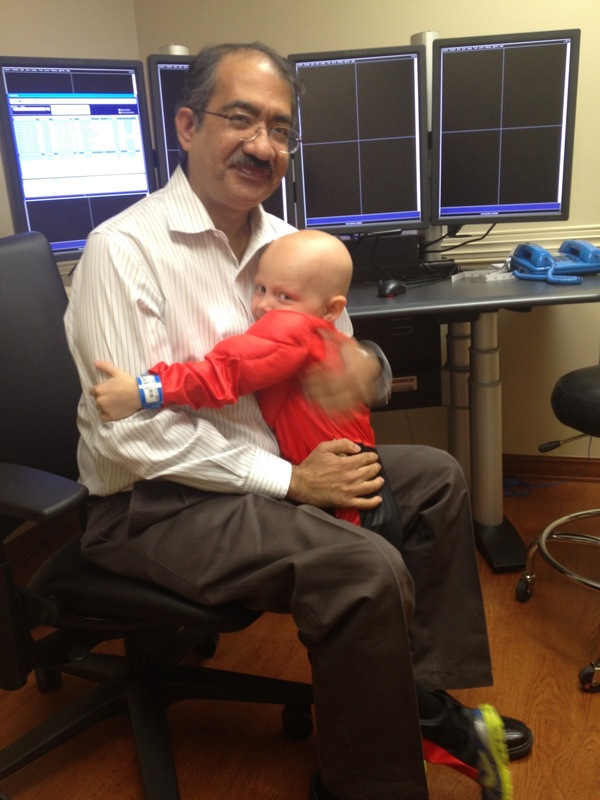 Ingram also loves Dr. Gajjar and everyone in E clinic. It was really cute watching him give Dr. Gajjar a big hug after he showed us the MRI results. It was appropriate. God has gifted Dr. Gajjar to heal a lot of kids. And he deserves a lot of hugs. After the E Clinic visit, it was Halloween time. Halloween at St. Jude is extreme. It is a blast. Many different departments in St. Jude decorate elaborately and the kids all walk through the main corridors trick-or-treating. The St. Jude people all dress up, the kids dress up. It is nutty. It is so busy, you can barely walk through the halls. Like all of the entertaining they do there, Ingram loved it. I had to leave St. Jude early to fly to Chicago. So I didn’t get to go trick-or-treating with all of the kids tonight. But it sounds like they had fun. I’m sure Ashley will tell us how it went in tomorrow’s blog. Thank you all for your prayers and notes today. It is overwhelming to get messages that people are praying before you even wake up. And then to keep getting them all day. Our next MRI will be in January. Please pray that it the tumor would not come back... ever. Ingram Isn't Really Excited about His "Sleepy Medicine"
Tuesday October 30th, Change Of Plans...Again! So until late last night, I totally forgot we had to go St. Jude today. I really do think sometimes that I'm losing my mind; I've been forgetting school work, forgetting after school activities, forgetting to close the fridge and washing clothes more than once because I can't remember if I washed them or not and more! I used to say that with each child we had, that part of my brain came out also; now, I blame it on the cancer and that's totally okay with me. I think for now, all five of us have an excuse to act a little crazy every now and then. Speaking of crazy, Ingram started out his day playing with Lay's Barbacue Chips for breakfast and by lunchtime, he was on another bag but still playing with his chips. Beau decided to try and eat his chips this morning and Ingram promptly told Beau that he had his own breakfast to eat in his bowl and that these chips were his. It's pretty funny listening to Ingram talk to Beau; even more funny than him talking is that he looked at him as if he was going to respond! Once we made it to SJ, Ingram had his speech lesson and then we headed for the Medicine Room to get accessed for his monthly infusion of his "lung medicine." Have I mentioned that getting accessed isn't very easy anymore? Ingram has kind of regressed and it's almost as bad as it was in the beginning; our nurses and doctors say that it's because he's out of habit since we're not at St. Jude on a daily basis anymore. We did it though and he got his medicine while he watched a whole Scooby Doo movie and ate lunch. As if getting poked once wasn't enough, he had to get a second flu shot which of course was another poke and it hurt. My heart was sad because I had to hold him down twice today which is two times to many! He fell asleep on the way home and even slept through getting two boxes of shirts from Craig's office! Unfortuntaely though, the boxes haven't been unpacked yet because we've been too busy to sit down. We had homework pluse make-up work for both girls, a soccer game for Lindsey and soccer practice for Madison as well as doing all the things I was going to do tomorrow while we were hanging around the house. We had to do them tonight because we got a call that our MRI had been changed yet again and we're first on the list for tomorrow....at 6:45am!!! So, we scrambled to get everything taken care of for the girls and packed Ingram's Halloween Costume (the Red Power Ranger) to take with us to the hospital. We weren't planning to go Trick-or-Treating at SJ since we were off, but now since we're going to be there at the crack of dawn, we'll have plenty of time to collect mass quantities of candy; I suspect Ingram will go to bed early tomorrow night since we'll have to wake him up at 6am and he was still awake after 9pm tonight! So...we are on the schedule for MRI of Ingram's brain at 6:45am. Officially, we will be playing and getting hooked up until about 7:30am; then Ingram will cry (since he hates the sleepy medicine) and be sedated for the imaging that will last about an hour or longer. He'll go to the recovery room and we should hopefully be by his side sometime between 9 and 10am. We will also meet with Dr. Gajjar to get our results and even though we know that God is in control and we totally trust Him with Ingram, we, along with our girls and Ingram, have prayed regularly for his scans to be clear and for the cancer to never ever return! Beau Trying To Eat Ingram's Breakfast! Apparently Barbacue Potato Chips Are Finger AND Paw Licking Good! But Then Decided Not To Because There Wasn't A Good Reason! After All, When Else Can I See His Eye Through A Barbacue Chip? Snuggling With My Little Man Before Bed! But Then They BOTH Fell Asleep In The Bed! Monday October 29th, What A Monday!! Wow! We had the best time today at the Memphis Grizzlies Tip-Off Luncheon at the FedEx Forum. When we were asked to be the patient family that gets to talk about St. Jude, we were more than a little excited. When we found out there would be between 500 and 1000 people in attendance, we were a little nervous, especially Mommy since all three kids would be there! The girls were great and Ingram stole the show...imagine that! Right when we walked in the door to the Forum, there were already a ton of business people there waiting in line to check-in. We definitely looked out of place, but that didn't stop the kids from walking around and talking to the cheerleaders and then The Grizz came up to us and scooped up Ingram and started playing with him and the girls. Ingram wasn't scared at all and instead wrapped his arms around The Grizz and didn't want to let go! Next up Mr. Shadyac came in and Ingram was all smiles seeing him and the "Emily's" (ALSAC's Director of Marketing and Chief of Staff, both named Emily) and then the girls started talking "business" and didn't stop until we left. Let me first say that our girls have been in several "business" situations since all they started fundraising, but today they took their behavior to a level I hadn't seen before. They were having conversations with the folks from St. Jude that hosted us and also having conversations with random people that were there...including the Grizzlies Management and the Grizzlies players. As a parent, you want your children to be on their best behavior always, but when they're at an event that's 99.9% adults, you really want them to behave. They amaze me every day in the "new" things that all three of them have had to deal with and the way they handle themselves. The first official introduction of the 2012-2013 Memphis Grizzlies was very exciting! The players were all sitting behind the stage and our table was right where the stairs were for them to get up on the stage. None of us could believe how big all these dudes were; they looked like giants compared to us, especially compared to the kids!! As they guys walked up onto the stage, each one gave Ingram, Lindsey, and Madison a "five" or a "duke" and we got the biggest kick out of watching how even Ingram's responses changed from shy to all out dancing as they were coming by. The food was great and it definitely wasn't "kid" food and none of them complained! They did try everything and then politely asked for the snacks that they knew were in my purse. All three of them also took the liberty of walking around and getting their basketballs signed by the players and management while we were eating so they wouldn't disrupt any of the program. Towards the end of lunch, the speaking started and then Mr. Shadyac got up and talked about St. Jude and then started talking about Madison and Lindsey's fundraising and everyone was applauding for them. They were just grinning and then Mr. Shadyac started talking about Ingram and Ingram decided that he needed to give Daddy a kiss before he went up on the stage. Apparently Ingram told daddy that he wanted to go on stage with him and Daddy said okay. So he followed him up the steps and Craig moved a barstool-type seat next to where he was talking. Mr. Shadyac helped Ingram up onto the chair - he is always great with all of the St. Jude patients. 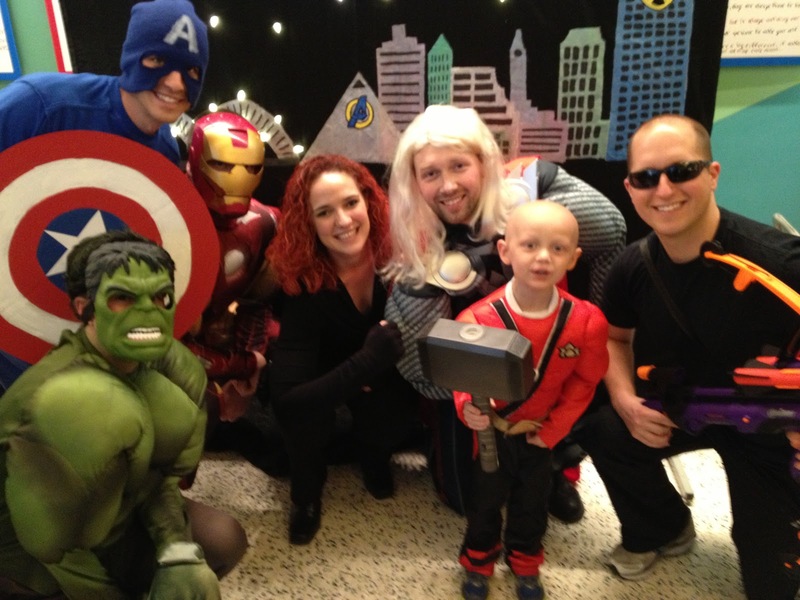 You can tell that he truly cares about the children and has an equal disdain for childhoow cancer as we do! Ingram was perfect sitting next to Daddy while he was at the podium and I think Craig's words made more of an impact with Ingram sitting right there than if he had just sat with us. Even though we've told the story a thousand times in different situations, we get very emotional each time and today was no different. The thing that gets us sometimes is that we haven't done anything for people to be thanking us. It's everyone else from our doctors and nurses who have been taking care of Ingram, to the hospital administration who puts everything in to place, to the ALSAC people who help us to not pay for anything, to the volunteers who spend their time at St. Jude, to people who give financial contributions of any size that are the people who we should be thanking! Craig was able to share briefly about the medical side of our story, but also spoke about the emotional side of things and how St. Jude is a place of hope for everyone. After it was over, we were packing up all our stuff to leave and player after player came over to Ingram and wanted to meet him. They were asking him if they could take a picture with him and it was just amazing! For as big as all the guys were, they were picking Ingram up so carefully and tenderly and it was so sweet. At one point Ingram put his palm against their palms to compare the size and the girls were astounded by the difference. These guys seem tough on the basketball court, but when they were holding Ingram and talking to him and playing with him, they were as gentle as they could be but also not afraid to lean down and grab him. Watch Out, The Grizz, These Kids Just May Take Your Show! There's No Telling What They're Going To Accomplish In The Future! Craig And Ingram On The Jumbotron! This Picture Was "Tweeted" By One Of The Grizzlie Players After The Event! Ingram Having A Ball With Hamed Haddadi And Zach Randolph! and has even donated money to Team Ingram last week at the soccer field! I'm Pretty Sure My Kids Are Going To Remember This Day For A Long Time! We had mentioned before that Ingram would have his Post-Treatment MRI and Spinal Tap on Monday October 29th, but that has changed. We have had an amazing opportunity that has come up for Monday and his test will now be on Thursday November 1st. Ingram has had these tests every two months during Radiation and Chemotherapy and they have always come back with no evidence of disease. While we are confident that they will come back clear again, we are asking for your prayers because things can get a little crazy leading up to these scans. Thank you sooooo much! Sunday morning was soooo nice! We made it to church after stopping for some Gibson's Donuts for Madison and Ingram. In less than 10 minutes, Ingram ate a whole glazed donut; can we say calories...woohoo! It's always comical how long it takes us to get to where we're suppposed to go once we get to church. The kids always make it to their rooms pretty quickly, but Craig and I wind up talking in the hallways, the stairwells, and even right outside our rooms probably 90% of the time. Today was no different and we wouldn't trade any of the conversations for anything! I have to admit that I beat Craig into service; it only took me an hour to get into the service once I was inside the building and he never made it. As we left church, we laughed because even though my birthday was Thursday, we still hadn't been able to go out to dinner as a family and celebrate, which is what we do for birthdays. We did today... and even madeit to an ice cream store right outside the restaurant! We went to Chilli's for lunch and sat at the very back table of the restaurant and had a great time together. We ate so much food, but all three of the kids said they still had room for Baskin Robbins so off we go! Once we were home, I put Ingram down for his nap (he tried the "I slept in the car" trick again but it didn't work) and this time Mommy laid down with him for a little nap. Once he fell asleep, I hopped up and snuck out so that I could figure out who needed to go where next and how it was all going to happen. Madison had Abby coming over and Lindsey had soccer and I had time to sit and get our week figured out... I thought! After I made dinner plans with the Wingfields, Craig called from practice and told me I had an hour to get dressed and ready and hung up the phone! What???? I tried to call him back and he didn't answer; I even texted him and he didn't answer! Madison tried to get him and he wouldn't answer and I had no idea what was going on! All I know is I had dinner literally about to go in the oven; friends coming over in less than 30 minutes; Madison, Ingram, and Abby are playing in the den; and I've got be ready to go in less than an hour. Did I mention I had changed into running pants and a t-shirt and pulled my hair into a ponytail??? I hopped in the shower and attempted to get dressed really quickly. I had no idea what was going on since he wouldn't answer and was trying to figure out what to wear. I know, it's crazy to be worrying about clothes, but I don't have the greatest fashion sense and I have no idea where I'm going or what I'm doing, so I just start putting on clothes. Then it hits me, the kids? What am I going to do about the kids? I don't have dinner. I don't have a sitter. Frankly, it's a bad idea and I'm not going anywhere. I haven't left Ingram in 7 months and haven't been out with my husband on a date in even longer. I CAN'T leave!! Craig gets home from soccer practice and hops in the shower after he tells me to keep getting dressed and that he's taking me out on a date. He doesn't seem to be understanding the fact that I can't leave Ingram at home, that we shouldn't go, or the fact that I'm not going! He's so sweet and he hugs me and tells me that we're leaving and everything is taken care of with the kids and our sweet sitter Rebecca is at the house and that it's time to go. After crying for a bit, I finally agreed to go and made it out of the bedroom and into the kitchen where the kids were but it didn't seem to phase them that I was leaving. Next is the laundry room where I got stuck and couldn't go any farther; if I went any farther, I would be in the garage and that would mean I would be leaving and I just couldn't do that. My sweet Craig could tell how hard this was and he was being so sweet and patient and letting me cry while he opened the door and walked me to the car. I cried some more as we left the driveway and of course while we were driving and he just held my hand and told me how much he loved me and how proud of me he was. We got to the restaurant, which wasn't our usual birthday restaurant, and I was so excited because we hadn't eaten there in probably 10 years. It was Folks Folly and is one of the best steak restaurants in town. If we're going to go out for the first time in 7 months, it might as well be nice. It wasn't just nice, it was fantastic... and I'm not just talking about the food. We were led to our table and it ended up not being a table for two at all. It was a whole room of 16 of the sweetest couples in the world, including my parents who drove down from Jackson, all waiting to surprise me for my birthday dinner! Have I mentioned I have the sweetest husband in the world???? I was in total shock and have never been 100% without a clue when it comes to stuff like that; I seriously don't think it has sunk in yet. I honestly don't think I can put into words how special tonight was and those that were there know that I had no words (or at least any words that made sense) when I tried to thank everyone before we all went home. I honestly felt like the most special gal in the room and was so honored to have my dear friends come away from their families and their committments to spend the evening with us to celebrate my birthday. Without Craig by my side and without our faith in God, I don't think we could have been able to get through these past 7 months without our friends. Our friends have prayed for us, prayed with us, prayed over us, taken care of our kids while we were unable to, and taken care of our basic needs while we were fighting for Ingram. Those who know me best, know my heart is full and how much tonight meant to me... even though I almost didn't even make it out the door! Happy Birthday Lunch To Me! You Made Me Feel More Special Than I Ever Thought Possible! I Thank God For Creating You To Be My Husband! Saturday October 27th, All Day And All Night!! Saturday morning I woke up to a nice and quite room!! No one was in the room with me which was kind of shocking. I thought for sure that Ingram would sneak out of his bed and head back down to his little bed next to me; but he didn't! He slept in his big bed upstairs in his room with Daddy last night for the first time since April 2nd and we were so proud of him. He came down when they woke up (after 8) and was just the cutest thing. He talked about sleeping in his room again that night and for 100 more nights. We're not jumping the gun here, but we're pretty excited about it! Soccer was next in the weekend line up with the girls having practice and it was freezing cold! Some of our sweet friends, the Whelans and the Bargers, had even offered to set up a Team Ingram table and sell t-shirts and take donations for St. Jude. Did I mention that it was cold? It was also windy and they manned the table for hours and had their kids walking up and down the fields making people aware of Childhood Cancer and how they could help. The Germantown Legends/Happy Feet Soccer Organization decided to even have a "Green Out" Day the last game day of the season to raise support for St. Jude and honor Ingram and his girls. We can't wait to see how much green will be out there! Once again, we're so overwhelmed by the love and support of our community when it comes to Ingram and all the children at St. Jude! Even though it was already lunchtime, we still had big plans for the rest of the day! We stopped at the store for some new clothes for Ingram since his clothes from last winter are too small. Even though he's shrunk down a little in weight, he's gotten taller and his pants are just a tad too short. The kids had fun though and Ingram ended up with a two pants and a pullover that he should be able to wear for a while. Madison even got lucky and found a couple things for her too! We were exhausted and needed to squeeze in a nap for Ingram before he headed off for the evening; you see, he has quite the social calendar and had two parties in the evening but we couldn't dare go grouchy! He asked Madison to sleep with him and she tricked him into going to sleep while she pretended to sleep. Once he was out, she scooted on over to the floor and played on her computer, but stayed in the room with him since she told him she'd still be with him when he woke up. That sweet girl didn't want to upset him since this whole "sleeping in his room" thing is new. Lindsey became a black panther while they were upstairs for her Halloween/Birthday party; she started out as a black cat, but honestly drawing on her face was so much fun that we turned pretty much the whole thing black and off she went roaring to the party. So before cancer, I was pretty good at keeping plans together and dates and times and all straight. Well, with the party Lindsey had, the party Ingram had, and our neighborhood party, I mixed up all the times and Ingram got to his party an hour late! But even though he was there an hour late, he still managed to play on the bouncy slide, jump on the trampoline with about 10 kids (that is until I caught him and got him off! ), run around outside in cold, wet socks, and EAT THREE HOT DOGS WITHIN AN HOUR!!! Seriously, he ate 3 hot dogs and had lemonade, chips, and cakeicing too. We never started back his appetite stimulant but I'm starting to wonder if he's somehow found some steroids and started eating those instead! He's making up for lost time I guess on the eating and I'm really excited to see what he's going to weigh next time we go to St. Jude! After we played with everyone, we headed to pick up Peanut from her party but she was not very happy with me! I got there late and missed the show; Alexandra's mom had taught them the dance moves to Micheal Jackson's "Thriller" and I totally missed it. Oh if I had a camera for the face Lindsey made, she would not be thought of as the angel that she is. So off to the house to drop her off and get Madison from the neighborhood party. Ingram had already been outside for much of the day so I left him with Lindsey and Craig at home; our friend and "bus buddy" Shelia Ferguson, set up a Team Ingram table and sold shirts at the party with our neighbors. I guess a neat thing is that our neighborhood is so big that not many people knew what was going on and now, through our friend Shelia, they know now. It's so fun to meet new people and to get to talk about Ingram, the girls fundraising efforts, and St. Jude! So by now it's after 8pm and we could all pretty much just chill out and go to bed, but instead we decide to go to Haunted Houston! It's our neighborhood middle school and they were putting on a haunted house; we knew people going so we went to check it out. Oh my goodness, our kids were crazy! You'd think normal 4, 8, and 10 year olds might start to wind down at night...not out kids, I think they were just getting cranked up for the evening! They were running around the school like they owned it with their friends and we don't even go there yet! I'm a little nervous about what next year is going to look like when we actually have Madison there. We ran into several families we knew and wound up in the cafeteria area watching the kids run around with all the energy in the world, especially Ingram! That joker talked Craig into getting a bag of M & M's at 9pm at night and it sent him into overdrive; then the music came on and well, who can sit still when there's music playing?? Certainly not the Dismuke or Wingfield children; they had so much fun dancing and I think we had as just much fun watching them. Thank goodness for bedtime that happened around 10pm and for the second night in a row, Ingram slept in his bed in his room with Daddy! He CONQUERed His Fear Of Sleeping In His Room...With The Help Of Daddy And His Girls! Germantown Legends Soccer Going Green For Ingram And St. Jude! Thanks To The Whelans And The Bargers For Braving The Wind And Cold To Raise Money For St. Jude! While They Were Scouting The Crowds For Donations! Have No Fear...Ingram The Conqueror Is Here! Madison And Shelia Ferguson At The Neighborhood Party. Her Costume For The Party Was Crazy Team Ingram! Thanks Shelia For Manning The T-Shirt Table. Carol And Ben Wingfield Were Pretty Brave To Take This Crew Into The "Scary" Haunted Houston! We Had Foot Smashers, Screamers, Hiders, And Hangers In The Crew! These Little Kids Were Teaching The Middle Schoolers A Thing Or Two About Dancing! Go Kate, Matt, Ingram, And Christina! Friday October 26th, Out And About Then Out Like A Light! This morning we slept late AGAIN! Overnight, I was exhausted from a too few hours of sleep over the last week and it was also raining. I don't know about the rest of the population, but that is not a good combination for me! Luckily, I had planned on driving the girls to school anyway today; it made me laugh though when the bus stopped at our house to pick the girls up and Madison was still in the shower! We made it to school on time since we bypassed the car line and the girls walked from the front of the school; they had their umbrellas with them to keep them dry so I think they liked it. Ingram stayed in his pajamas for the day but I changed and off to run errands we went in the rain...because we just had to get them done! Our favorite stop was to J. Crew to switch around some birthday clothes and we had the best time talking with everyone for well over an hour! I even had them help me put outfits together with things I already had at home and new things I was wanting to get since I'm not the one in the family with the best eye for fashion. It was so much fun too; it was like I had a personal shopper with me! Ingram was great; he played hide and seek, helped me pick out clothes, and danced in front of all the mirrors. He even broke out his dance in front of everyone where he holds his foot and tries to jump or something; it's kind of like "the sprinkler" for your feet I guess you could say. He even had to go to the restroom two times and just couldn't figure out why he couldn't go into the back (the stockroom where the restroom and all the clothes/shoes/accessories were stored) by himself. He's a funny little thing, but of course in Ingram style, he had everyone in the store talking to him and he was telling them about his cancer, his surgery, his St. Jude, and of course his Daddy that took him shopping there "for Mommy for her birthday since she got older." I just love how he talks to EVERYONE about EVERYTHING! We also grabbed a quick lunch since it was 1:30pm and we still hadn't eaten lunch. Let's just say Ingram ate all morning at the house and wasn't quite ready for lunch when normal people eat lunch. On the way home, I told Ingram that he needed to take a nap when we got home so he could stay up late with Daddy tonight. We were one street over and he asked if he slept in the car, if he could skip his nap. While I was laughing I said that he could skip nap if he slept (he didn't realize we were one street away from the house) so of course he shut his eyes and then miraculously woke up when I turned the corner to our house. Mr. David and Miss Laurie came in town also to celebrate her birthday. They stopped by the house just in time to walk Lindsey and Beau to Bible Club down the street. Poor Beau had been outside all day in the cold rain while we were gone. When we got home, I left him outside because he had chewed open a package that had a very expensive "hospital" thermometer in it! I decided it would be in his best interest for him to stay outside so nothing "happened" to him while I was mad. It was a combination birthday present from Craig's parents to both of us even though Craig's birthday was in July. With everything going on, they couldn't remember if he got a present or not and of course we couldn't either. We've all been checking our temperatures and shooting the covers at each other and I have to admit, it is pretty fun to do. No wonder Ingram shoots it every time in the hospital! Another big event happened tonight...Ingram went to sleep in his own bed in his own room upstairs!!! He has not slept in his room since Monday April 2nd, but with Daddy's help, he went to sleep in his big boy bed. Of course he was crying and throwing a fit about sleeping upstairs, then once we played in his room and got his bed ready, he decided to throw a fit about wanting to sleep with Mommy. Madison and Lindsey were great with him and told him all sorts of things that they thought would make sense to him. I think they both wanted to sleep with him, but we built tonight up as a "boys night" and no girls were allowed! Craig had his phone and was taking pictures and I think they were playing games too. He did text me to let me know that Ingram wasn't crying anymore and that he was already alseep. I texted back about two mintues later and guess who else was asleep! So the girls are in their room, Craig and Ingram are in Ingram's room, Beau is in his crate, and I get the bed and the whole room to myself...I think I'd rather sleep upstairs with them too. Stopping By Bank Tennessee Was Our First Errand This Morning. It Was Raining So We Went In The Drive-Thru Instead Of Going Inside The Bank Today. They're Sporting Our Bands And Raising Money For Team Ingram. Ingram Trying To Squeeze In A Nap One Street Down From Our House! "But Mommy, I Got All My Sleepy Out!" Getting Ready For Bed In His Big Boy Bed! Daddy Snuck In The Head Lamp To Play With After It Was Lights Off! They're Both 4 Years Old Sometimes I Think!! Less Than 30 Minutes Later, They Are Both Sound Asleep!! I May Get In Trouble For Posting This, But It's Just Too Cute! Thursday October 25th, Happy Day! Normally, birthday's are celebrated at our house on the actual birthday, but in my mind our little family of five was going to be too busy tonight, so I said my birthday needed to be celebrated last night instead of tonight. I didn't communicate that I was asking for the whole birthday celebration to be held last night to Craig and even though he and the kids had been shopping for at least a month already, I caught him off guard! Needless to say, at 9pm we finally sat down in the den to open presents after not even eating together since they were running 3 miles, Ingram was hungry and ate while they ran, and I snacked on food all afternoon, and the girls both had homework to do, we didn't sit down as a family for dinner. Then we were grouchy and even bickered about opening presents and finally the kids won and made me open my presents. Have I said before that our emotions are running rampant around our house with scans approaching?? Today my real birthday celebrations started with a bang!! I woke up for the second day in a row at 7am after going to bed after 1:30am (I'm one of those people who REALLY NEED about 10 hours of sleep to function and be sweet) but my girls and Ingram were so sweet this morning; we even finished off the ice cream cake from last night for breakfast. Speaking of last night, the girls asked me where the cake went and I had to explain that after they went to bed, Allyson Ferebee and Stephanie and Bryce Bailey (Team Ingram fundraising gurus!) and we ate it all. Craig and I spent a few hours listening to all their ideas about how to raise funds and we're super excited about them all. Stay tuned for more information one future Team Ingram and Kids Conquering Cancer events!! Now back to today...Kari Smith and Sarah Scott, a couple of my closest girlfriends, planned a birthday luncheon for me today and it was so much fun. We did what all girls do when we get together; we talked and ate lunch and talked some more. Of course Ingram was also there and had had everyone laughing the whole time too. He painted while we ate and then decided he was ready to eat his lunch; the kicker here was that he asked Mrs. Sarah to fix his plate instead of me! I couldn't believe that little stinker, but at least he sat with me and sang when they brought out the cake. He even helped me blow out my candle. I heard a friend say the other day that when she's feeling down that all it takes is another friend coming over, making her get dressed, and going somewhere to help her feel better. Well, I'm not feeling down (that I know of) but we are on a roller coaster of emotions and all these girls and their families have been through these almost 7 months with us, but today really made me feel special. A fun little extra is that since I opened my birthday presents from Craig and the kids last night, I got to wear a couple of my new things today. Ingram always says he's the luckiest kid inteh world, but today I definitely felt like the luckiest girl in the world! This afternoon was the normal chaos that included Ultimate Frisbee for Madison afterschool and also two soccer games. We would have had soccer practice for Lindsey also but Mommy fell behind on the homework routine from lack of sleep and riding the emotional roller coaster and we had to do intense studying with Lindsey for the afternoon. We finally hit the homework wall and had to get outside for fresh air and what better place to do that at than the soccerfield for the last bit of Madison's game. We also met up with the Callender family at the soccer fields! They are dear friends that came to St. Jude a few years ago from Lousiana for their sweet Ally to be treated for Neurobalstoma. The whole family came in town last night for her 1 and a half year post treatment scans and I'm honored to report that her scans were CLEAR!!!! We celebrated on the soccerfields with brand new Vuvuzela's that Craig ordered for the marathon weekend...and they are loud!! Craig and Ingram introduced them at the soccerfields and everyone (except the first family that Ingram came upon in the parking lot) loved them. Before Craig could get around the car to stop Ingram, he had blown it about 3 times right inside the rolled-down window of their car where they were sitting! We headed to Moe's for dinner after the game and the Whelan's joined us as well. The kids were all so cute and pretty much well behaved as we were the last customers in the restaurant. Once we finished dinner, we all had to go our separate ways, but it sure was great to catch of with our friends and let the kids have some crazy fun outside of Moe's blowing the Vuvuzela's at 9:30pm outside Moe's in Collierville. I'm pretty sure we broke some sort of noise ordinance, but the kids sure were having fun together! Enjoying My Early Birthday Presents With Craig And The Kids! It's So Great To Just Be Able To Sit Around And Laugh! Luckily, Spending Time With These Gals From 9pm To Midnight Will Produce Lots Of Laughter!! Thanks Stephanie And Allyson For Heading Up The Fundraising And For Making Me Laugh! But Who Else Can Look This Great Doing Monkey Face With Ingram!! Oh Yeah...Check Out These Shark Faces!! These Girls Are So Going To Get Me For Posting These Pictures! See, I Also Put In The Good Picture Where We're All Smiling. They Can't Get Upset At Me For The Pictures Now, Right? Ingram Wasn't About To Let All These Kids Get Ahead Of Him! I'm Pretty Sure They Heard Us All The Way Downtown At St. Jude!! The Whole Crew, Well Almost, Craig Took The Picture For Us. We Love The Callender Family!! These Crazy Kids Were Making All Sorts Of Noise Tonight After Dinner! Even Though They Hadn't Seen Each Other In Months, They Acted As They Played On A Daily Basis. Wednesday October 24th, A Swashbbuckling Good Time! We were back at St. Jude today and it was really nice to be there. We hadn't been back since last Tuesday and it's definitely been hard getting adjusted to our new schedule. We know it's good to not have to be there every day, but at the same time, it's "safe" to be there every day if you know what I mean? I know, I'm starting out kinda shady, but you go from one drastic of being at SJ everyday to being there only once a week to only being there once a month to once every three months and it's just a difficult adjustment. I guess now we also have more time for the emotional side of things to kick in as well; the crazy thing is that some members of family can cry at the drop of a hat now and I'm not sure if that's a good or bad thing! Our first appointment was in the lab this morning and we were early and they were running behind so we made the cafeteria our first real stop. Mommy needed some caffeine after staying up till after 1 in the morning and Ingram was more than happy to run through and pick up some chips for a snack too. Of course since he was in "run" mode, he wanted to race to the lab once they called us to say it was our turn. Then in true Dismuke style, he got distracted by his friend Mae and then by the Pharmacy table where he go to count out pills and pretend to dispense medicine. Surprisingly, he counted to 10 without help and most days, we consider that a victory! After crying in the lab getting poked, he headed off to speech with Mrs. Angela and then to the Audiologist to have his third hearing test. They do these in two month intervals to make sure that the chemotherapy drugs don't have any ill effects on his hearing. The good news is that his hearing is great (so now there's no reason for him not to do what he's told right?) but the bad news is that he had a ton of wax that he wouldn't let our Audiologist get out and now it's just all I can see when I look in his ears! Oh well, it'll come out at some point right? Target sponsored another quarterly party today and it was a "Yo Ho Pirate Party!" and it was soooo much fun! Ingram had a blast and made a pirate hat and sword, got tattoos for his arms and a pumpkin and a bat on his cheeks. He even got pirate earrings and made a pirate telescope to spy on everyone so that he's always in the "know." He had to walk the plank and then also went pirate bowling and scored some serious goodies by the time we left. I decided that we didn't need our normal backpack and took my purse instead today; that was a big mistake that won't happen again! I was toting around 3 different bags of stuff all day long. We didn't have soccer today and I was so excited about going home and getting into my pajamas after a long day at SJ. I should have known that wouldn't happen; the school called on our way home and we stopped on our way home to pick up the girls, yes, that's correct, both of them! Madison pulled her wire out of her braces and had to go to the Orthodontist, but we wouldn't be back before Lindsey got home from the bus so we had to take her too. On the way out of the school, we stopped on the side of the road at two huge tables of lemonade and cookies that some of our GFL cheerleaders and football players were putting on to raise money for Team Ingram and St. Jude. They were so cute and raised $465.44 in just 3 hours of standing on the side of the road selling lemonade and cookies! After we got a snack and took some pictures, we headed off to get Madison's wire fixed. The best thing that came out of our orthodontist visit, and trust me it was not pretty since Ingram really needed a nap, was that both girls got adjusted and now we don't have to go back for another month. After leaving at 8:15 this morning, we finally got home around 5pm and were so exhausted! We had to do homework and then the girls went running with Craig to get ready for the 5k. I'm happy to say that even though they started out kind of crazy (the girls were trying to knock each other down I think when they took off), they made it home in one piece and ran a 3 mile loop and were still smiling. The Murphys, one of our neighbors came to the house the same time they did and had their dog Harper with them. Beau has always been a friendly dog and talks (barks obnoxiously really) to everyone who goes down our sidewalk, but tonight we learned he really doesn't like it when other dogs come into our yard. For a small little dog, he can sound absolutely crazy and it seems that he also needs to learn to play better with others! On Your Mark, Get Set, RRRRUUUUNNNNN!!!! Wait, I Need To Count These First, Then We Can Finish Our Race! Now You Better Watch Out! I've Got My Sword Ready To Make You Walk The Plank! GFL Just Keep Getting Better And Better! Tuesday October 23rd, He's Only Four! I don't even know where to start for today; it's been such a full day of activity and such a full of emotion. I guess that it doesn't help that it's 11pm and I'm just sitting down at the computer either! Today was the 50th day of school so everyone dressed from the 50's; I had two of the cutest gals in poodle skirts "do whopping" their way to school this morning! To add even more fun to being dressed up, the third grade had their Sock Hop today. They all did the so many of the fun dances from the 50's; the boys and girls even danced together in a few of the dances AND didn't get upset about having to dance with each other. Ingram wanted to get in on the action and snuck in a dance with his favorite third grader Lindsey. He watched them do the "Hokey Pokey" and then ran along with them during the "Limbo;" he had so much fun running all around the gym floor slipping and sliding in his socks! After all that exercise, we were both so hungry and headed off for lunch to Chick Fil A of course! Ingram downed a whole cup of fruit punch and ate all 6 of his chicken nuggets and french fries. I have a feeling I'm going to be very excited when he stands on the scale in the morning for his weigh in at St. Jude!! We still had some time to use before his nap so he entertained everyone at our early voting place, including one of our neighbors Sharon Mrok. He was so good and we were out of there in less than 30 minutes to head home for a quick nap before the girls and Mr. David got home from school. During his nap, I can't remember what all I did, but I do know that the laundry did not get done because there's three loads stacked in the living room to fold and I think one more in the washer... oh well, there's always tomorrow! Once they were home, Mr. David entertained Ingram while I did homework with the girls, made snacks for all of us, and got them ready for soccer! Luckily, our friends the Wests were heading to the soccer field that Madison was going to and she caught a ride with them while I took Lindsey to another field for her game. I didn't forget Ingram, but it did feel pretty weird not to have him talking in the background all night. Since I was by myself for 15 minutes, I decided to run into the gas station and splurge on a Diet Dr Pepper and some M&M's...I know, I'm just that wild and crazy these days! Speaking of Ingram, he had "an appearance" to make at the GFL practice so I put Craig and Mr. David in charge of him from 5:15ish when we left for soccer until we met up for dinner around 8pm. I'm not sure what all they did before going to the field, but it included Craig and Mr. David running and Ingram riding his scooter for a lot longer than 2 houses which is as long as he normally rides with me. Once they were at the GFL practice fields, he was in boy heaven and having so much fun! He played football with the big boys and they ran some plays just for him; I saw pictures of him running and catching but I'm not sure if I saw any of him kicking. He and Craig also talked to the boys about how excited we were about them raising money for St. Jude and how much they can make a difference in the lives of the children that are diagnosed with cancer and other catastrophic diseases. By the end of practice, Ingram had given either a "duke" or a "five" to every kid there. I can't tell you how lucky we are to be involved with such great kids and such a great community. My emotions are so crazy these days and a lot of it is due to how compassionate other people have been towards our family but especially Ingram and the girls. We met up with Craig, Mr. David, and Ingram at Russo's New York Pizzeria for dinner; we must be there all the time because Ingram feels very comfortable there. How do I know this? Once we got seated, he started walking around the restaurant with his "bag of cards" and started handing them out to everyone in the restaurant! These cards have information about how to donate to St. Jude, about his blog, about how to order shirts, and more. Once we realized what he was doing, Madison went to get him but she started laughing too much. He was just telling people "I'm diagnosed" and would give them a card. She came back to the table without him so we sent Craig to get him. Everyone he stops winds up leaning down and talking to him and he's just having his own little conversations with them; by now everyone in the restaurant is looking, pointing, and smiling at him. They all wanted cards I think or maybe just to tell him "Hi" and see what he's handing out I guess; these are the things a normal 4 year old doesn't do. But since Ingram was diagnosed with cancer, we spread the word everywhere we go and to everyone we can to help find a cure for cancer...and so does he. Bedtime is always the same for Ingram. We always leave the bathroom light on and the closet light on and have the little floor fan on to drown out the occasional snoring of Daddy and the super loud noise of Daddy's alarm clock at 5am. We sing "Jesus Loves Me" and say prayers and Beau also has to give Ingram his kisses. Sometimes he repeats the prayers phrase by phrase after us and other times he has us say the prayers. Well tonight, he wanted to say his own prayers and this is what he said..."Dear God, Thank you for today. Thank you for Jesus. Thank you for giving me cancer." That was it. That was his whole prayer. He thanked God for giving him cancer. We have never thanked God for giving him cancer. We have thanked God for many things along the way like giving us clear scans and spinal taps, for all the tumor being able be resected, for getting through radiation and getting through chemotherapy, but we have never thanked God for giving us cancer. We thank God every day for healing Ingram's body and for our doctors and our nurses and for taking his cancer away, but we have never thanked God for giving our family cancer at all. I think our four year old son has reached a level of spiritual maturity that I don't know I can ever reach and for that I love my God "who has brought us out of the darkness into his marvelous light" even more tonight. I guess I'll be thanking God for giving us cancer from now on too! Ingram Watching His Lindsey Do The Twist! Ingram Finally Decided To Try The Twist! If At First You Don't Suceed, Try And Try Again! Third Time Was The Charm For Him! Ingram Flying Through The Limbo With Lindsey's Class! Ingram With Mrs. Berry's Bullfrogs! Ingram With Lindsey And Her Dance Partner For The Sock Hop! Ingram, Craig, And The GFL Patriots! Ingram And Craig With More GFL Studs! Ingram Running The Plays With The GFL Saints! Craig And Ingram Talkling With The Guys At GFL Practice. Is Helping Ingram ANd Other Boys And Girls Conquer Cancer! One Of The Many Sweet Folks That Ingram Talked To Tonight At Russo's! Pretty Sure He Handed Out About 50 Cards! Saturday October 20th, GFL Goes Green!! Thursday October 18th, Where Did Our Day Go? Tuesday October 16th, Really...A Week?? Monday October 15th, A Boring Monday! Sunday October 14th, Closer To Normal?? Thursday October 11th, Watch Out Virginia!!! Tuesday October 9th, NO MO CHEMO!!!!!!! Monday October 8th, The Zoo Then The Boo! Saturday October 6th, Another Change Of Plans! Friday October 5th, Change Of Plans! Thursday October 4th, Wake Up!! Tuesday October 2nd, More Birthday Fun! Monday October 1st, Happy Birthday Ingram!!! Sunday September 30, Another Big Day!